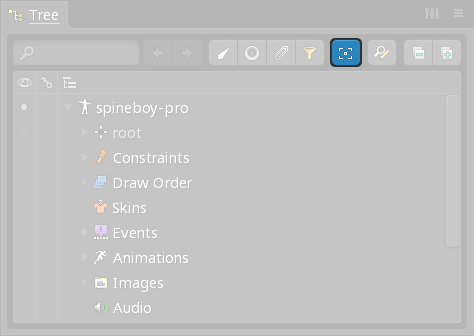 The Tree view is central to Spine, providing a hierarchical view of the entire project. 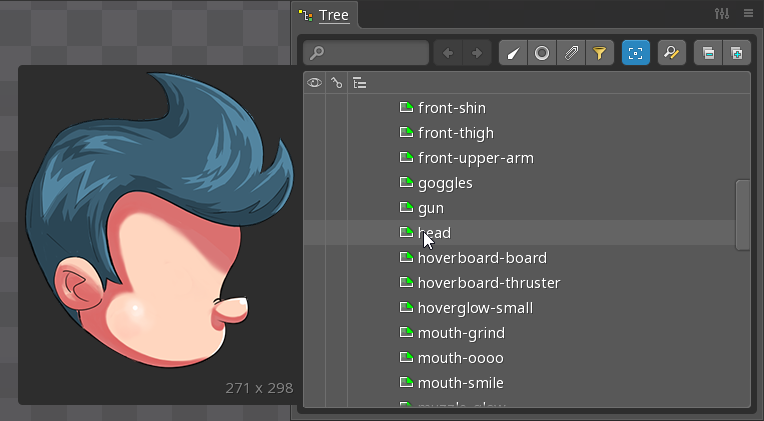 A tree node can be expanded or collapsed by left clicking anywhere left of the node's icon. To expand or collapse a node and all it's children, right click the node anywhere. The Expand and Collapse buttons can also be used to expand or collapse the selected nodes and all their children. If no nodes are selected, all nodes are expanded or collapsed. Double click Collapse to collapse all nodes except for the skeleton nodes, which can be convenient when many nodes are expanded. Items that can be renamed can be double-clicked as a shortcut to open the rename dialog. Nodes that have a "New" button (such as Skins, Animations, etc) can be double-clicked to create a new item. 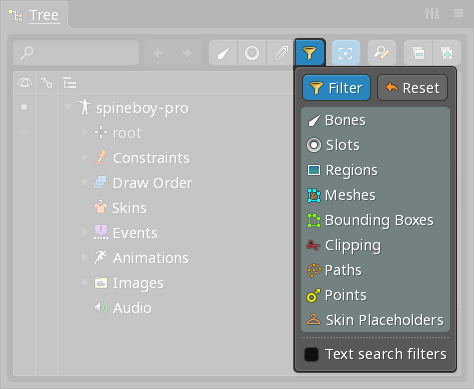 Right-click on a bone's visibility dot to toggle the dots of its descendant hierarchy, which includes that bone and all of its child bones and slots. A tree node can be selected by left clicking the node's icon, text or the space to the right of it's text. Hold ctrl (cmd on Mac) when left clicking to select multiple nodes. Select a node, then hold shift and select another node to also select the nodes between them. When one or more tree nodes is selected, their properties are shown at the bottom of the tree. Some properties can only be edited when a single node is selected. The three buttons at the top of the properties are enabled for most tree nodes. Duplicate Duplicates the selected items. Rename Opens the rename dialog. As a shortcut, the rename dialog can also be opened by double clicking a tree node or by pressing F2. Delete Deletes the selected items. Many tree nodes (bones, slots, and attachments) can be dragged to a new parent node. This is equivalent to clicking the Set Parent button and then clicking the new parent. While dragging, if the mouse goes above or below the tree, the tree will automatically scroll. The mouse wheel can also be used to scroll while dragging. 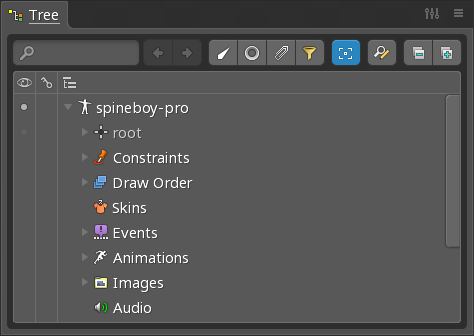 When Auto Scroll is enabled, the tree will automatically expand and scroll to nodes when items are selected in the editor area. In some scenarios you may prefer to disable Auto Scroll so you don't lose your place in the tree. The filter buttons can make certain tasks much easier. 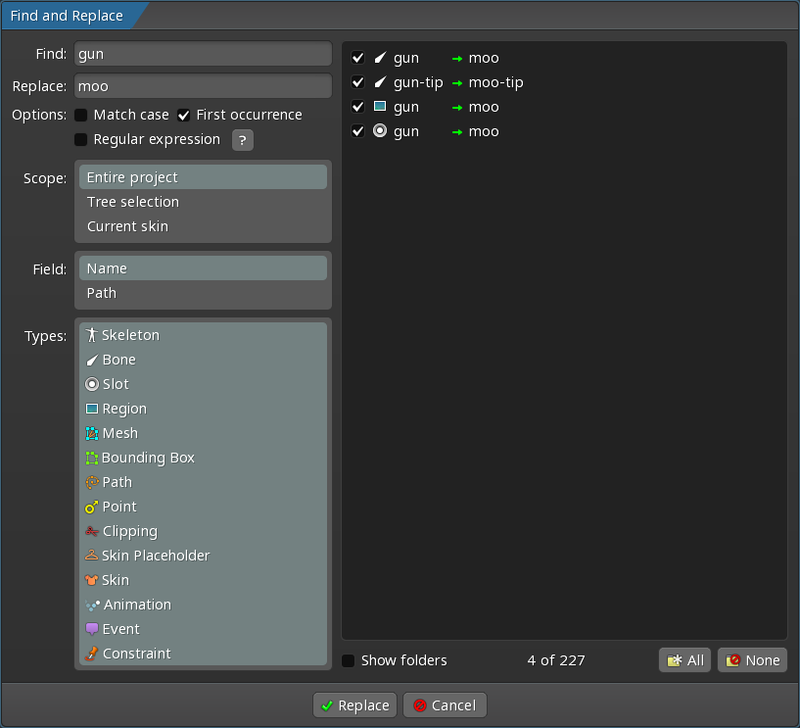 If an attachment is selected in the editor area and attachments are hidden in the tree, then the attachment's slot is selected. 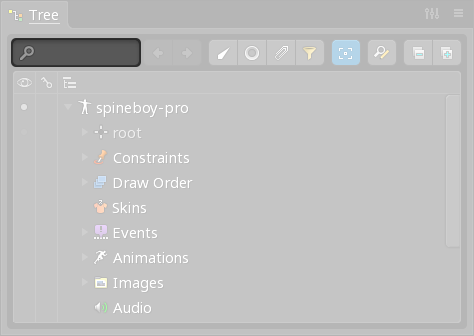 If the task is to select a number of slots (eg, to change their color), by hiding attachments the slots can be selected in the editor area. 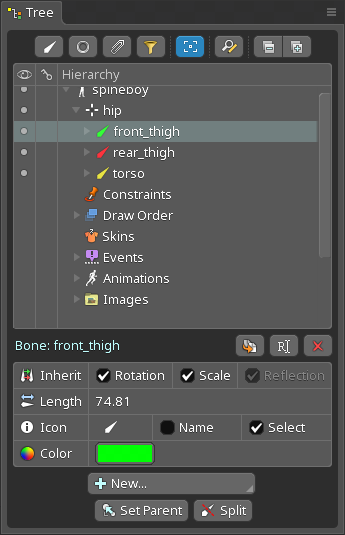 Draw order can be adjusted more easily by hiding bones and attachments. This also makes is possible to select many slots in the tree by holding shift to select a range. There are other scenarios where the filter buttons can make tasks more efficient or reduce clutter in the tree, so be sure to keep them in mind. This button opens the Find and Replace dialog. This is a powerful tool for modifying the name or path properties of items in the tree all at once. When text is typed into the Find and/or Replace text boxes, the panel on the right displays the matches and shows the replacements. The green arrow indicates that the replacement is valid. A red arrow indicates a problem with the replacement. For example, some names must be unique and blank names are not allowed. When Match case is checked, the capitalization of the Find text is important when searching. Scope specifies what part of the project is searched. Entire project will consider all items in the project. Tree selection will only consider items that are selected in the tree. Tree filters can make selecting many tree items easier. Field specifies whether the Name or Path fields are being searched. Types specified which types of objects to consider. When Regular expression is checked, the Find text is used as a regular expression. This provides a somewhat cryptic but extremely powerful way to find and replace. Providing a complete guide to regular expressions is beyond the scope of this documentation, but below are some examples searches. The Type to search textbox allows searching for items in the hierarchy. Press enter to focus the text box. Type inside the textbox to search for a term. Press enter, F3, or click the next arrow to select the next search result. Use shift + enter, shift + F3, or the previous search arrow to select the previous result and escape to clear the text box. Checking Text search filters in the tree filter popup will only show elements that match the search text in the tree. Type a / at the beginning and at the end of the searched text to enable regular expressions. * matches any characters. ? matches any single character, and \ escapes any literal /, *, and ?. When the mouse is left over a slot or image in the tree for a moment, the image is displayed in a popup next to the tree. F1 can be used to show the popup instantly. This can be disabled using the tooltips setting. In that case, the popup can still be seen by pressing F1.